Film tapes come in several variations. At Cheever we work with several different manufactures and customers to provide these tapes. Polyester film tape is one of most common tapes that can be used for splicing and applications where chemical resistance and or/or clean removal is necessary. This is a Polyester backing with an Acrylic (transparent) adhesive in your choice of color. 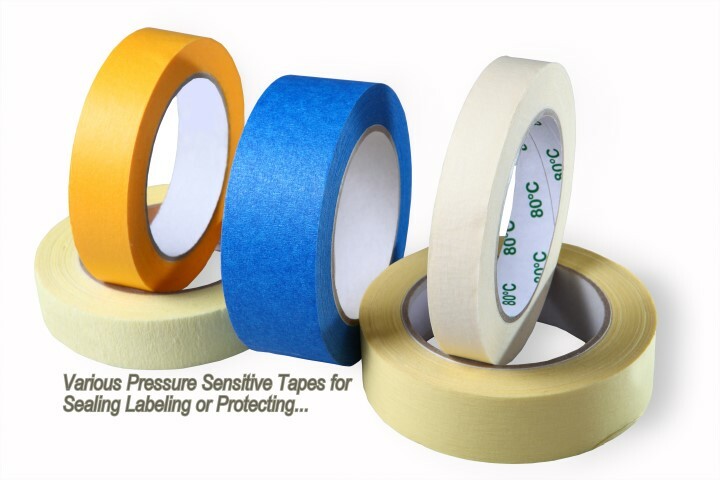 Choosing a Pressure Sensitive Tape can be over whelming with the options available. Configuration from adhesive type, tack, cost, UV, release liner etc, we thrive at the challenge of helping you work through these options for your next project. We have an array of different choices to help you define these decisions, all while giving you the option of having us hold Inventory for you. Below is a brief outline of some of our offerings and where they are commonly used. All though the list is not all inclusive so please contact us for just a quick question or to discuss your new project - we are listening!! Can withstand higher temperatures than both Acrylic and Rubber. This adhesive is more expensive and has a very log initial tack. Not recommended for high heat environments. Rubber is the most cost effective PSA and offers quick stick capability. This adhesive is base on natural or synthetic rubbers and formulation with tackifying resins, oils and anti-oxidants. Able to work in higher temperatures, Acrylic based adhesives develop a stronger bond than the traditional Rubber adhesive. There is no release liner with these tapes. Duct tape, masking tape and carton sealing tape are examples. The carrier is coated on one side with a PSA and a release coating on the other. Has an unsupported mass of adhesive film coated on a release liner which has a release coat n both sides. These tapes adhere to irregular surfaces well. Uses include carpet tape and laminates. The carrier is coated on both sides with a PSA. There are several options for the choice of carrier being used in combination with the adhesive. Carrier material could be, nonwovens, tissue, plastic films. In this case the adhesive is coated on the Facestock (material). A silicone coated release liner is used to protect the adhesive.